The world's longest aircraft has just been unveiled in Britain's biggest aircraft hangar. The unique, aerodynamic shape of the helium-filled balloon means it can generate lift just like an aeroplane wing. This enables the designers to make the machine heavier than air, which cuts the need to have dozens of crew hanging on to ropes holding it down every time you land. In fact, you can land it via remote control, on water. 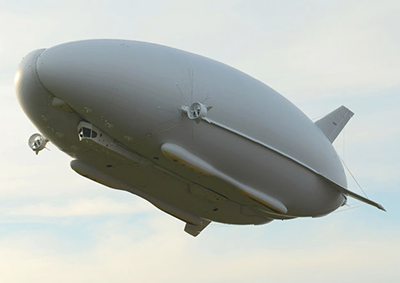 With a length of 92 metres the new airship is 20 metres longer than a Boeing 747-8. It costs £60m and the designers are planning an even bigger version that will eventually be able to carry 50 tonnes at a time. It is 70% greener than a cargo plane. It doesn't need a runway, just two crew. And it can plonk 50 tonnes anywhere in the world you like, which is 50 times more than a helicopter. The HAV, which has been named Airlander, could ferry tonnes of supplies to and from any disaster zone, day in and day out. All you would need is a crew of two and a patch of ground, or water on which to land. Created by Luke Phillips. Works in most modern browsers. Lots of fun. 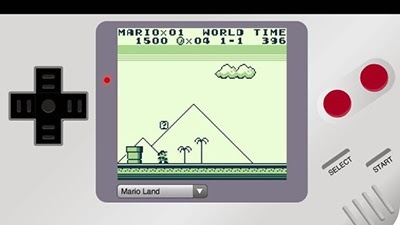 Ben Midi’s Gameboy runs inside your mobile Safari browser. Just select one of the 13 available Game Boy games, slap a Vanilla Ice cassette into your tape deck, and pretend it’s 1990. Lotus has taken the covers off the new motorcycle it will produce as a road bike and go on sale within months. The German-owned company Kodewa which has a licence to run the Lotus name has now officially revealed the final styling of the bike and technical details. The engine is a 1195cc V-twin from KTM’s RC8R superbike with a claimed 200bhp and dry weight of 180kg. 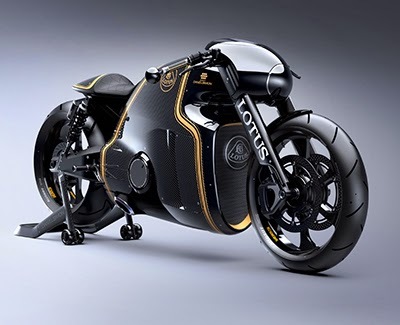 The C-01 motorcycle is not designed, engineered or produced by Group Lotus plc but is the result of a collaboration between motorsport veterans under the leadership of Kodewa, led by Dr Colin Kolles. The development on the C-01 was carried out with the support of Holzer Group (co-owners of Kalex) and design guru Daniel Simon. The C-01 will be available in a range of liveries some of which pay homage to Lotus’ sporting pedigree. A customisation service is also available. Only 100 units will be produced. Human photographers aren’t the only ones dragging their cameras to every corner of the globe in search of the decisive moment. 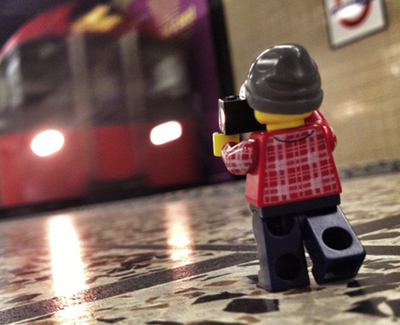 As it turns out, a little LEGO man spent a year doing the same thing as part of photographer Andrew Whyte‘s The Legographer series. The photos were shot on an iPhone 4S using the 645Pro app and edited in Snapseed. "For my first attempt at a 365 series I knew it had to be portable and spontaneous — my commercial photography, long exposures at night, is rarely either of these. My mobile phone fitted this agenda perfectly and had the added bonus of having a much closer minimum focusing distance than any of my Nikon gear. That’s how I get up close to the figure and force the perspective to make him look life-sized. 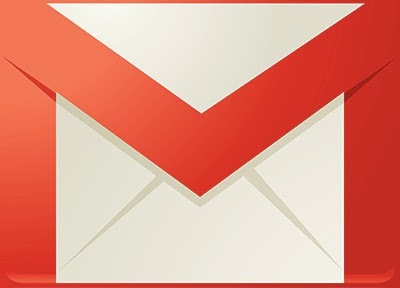 The Huffington Post has published an informative article on a number of useful Gmail features. 1. The dots in your Gmail address don't matter. You can email JohnDoe@Gmail.com, John.Doe@Gmail.com or J.o.h.n.D.o.e. @Gmail.com and they will go to the same place. 2. If you add a "+" sign and then any words into your Gmail address, it still works. For example, if you were to subscribe to a shopping site and your email address is JohnDoe@Gmail.com, you could use the email address JohnDoe+Shopping@Gmail.com to sign up. You'll still get your emails and you'll be able to filter them more easily by which address emails are sent to. Plus, if you get any emails from another site to JohnDoe+Shopping@Gmail.com, you'll know who gave your email address out. 3. You can 'un-send' emails. Gmail has a 'lab' that gives you a few seconds between the moment you hit the send button and the moment it actually sends and allows you to stop an email from sending. 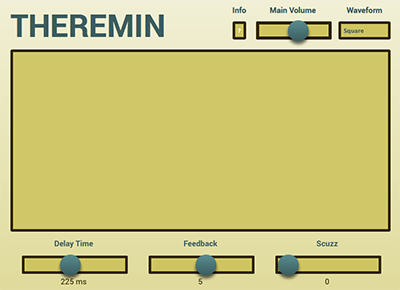 All you have to do is click on the gear in your inbox, go to 'settings', then to 'labs'. Scroll down, find the lab called 'undo send'. Click 'enable, then 'save changes'. Tourniquets are useful tools for injuries to extremities, but gushing wounds in the pelvis or shoulder require a different approach. The current standard of care is stuffing gauze into the wound. 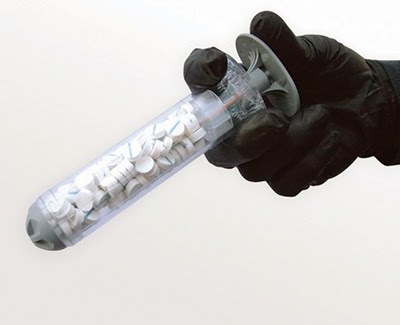 Not only is gauze not FDA cleared for this application, it’s often painful, imprecise, and ineffective, requiring field medics to repeat the agonising process. A company called RevMedx decided to approach the problem in a different manner after being inspired by expanding foams used to patch tires and walls. Realising that foams wouldn’t be effective, they cut up ordinary sink sponges and stuffed them into wounded pigs. It worked, and a $5 million development contract from the U.S. Army followed. Each sponge is made of wood fibres, coated with a coagulant derived from shrimp, and then compressed to a quarter of their original size. Once inside the body, a combination of pressure caused by their expansion and coagulant applied throughout the wound combine to staunch the blood flow. Inserting the sponges was another challenge. Reducing the size and weight were the top priority. One of the most challenging aspects of the procedure is reaching deep wounds. The sponges expanded so quickly they needed to be kept dry as they enter the wound, so Park and his team crafted a tip for the device made of grooved silicon that rips open as the sponges are forced through it, keeping them dry and clean until they reached their destination. This car can fly - and you can order it today for £75,000. 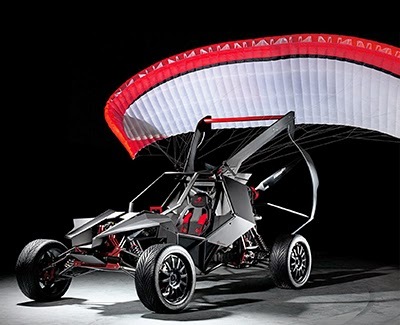 Launched in the UK in January, the Parajet SkyRunner was designed by British aviation engineer Gilo Cardozo and his team at Dorset-based Parajet Industries; it is a high-speed off-road car which turns into a paraglider that can fly at 88kph at up to 15,000 feet. "It's a new type of recreational machine - the only flying car you can actually go out and buy," says Cardozo. The SkyRunner is made of carbon fibre, titanium and aluminium. Before takeoff, a 0.2mm-thick nylon polymer wing is unfolded from the boot and laid out behind the car, and a switch in the cockpit disengages the wheels and powers up a three-bladed propellor. When the car reaches 60kph, the parachute wing rises up, and you have liftoff. Already known for their design contribution to the likes of Ferrari, Pininfarina is synonymous with beautiful, luxurious aesthetics. But now they'll be known for something a little bit different. 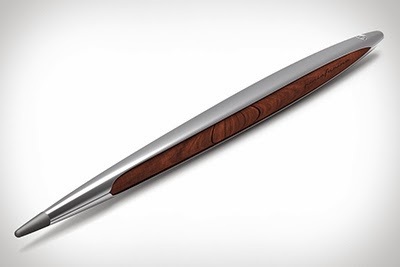 At first glance, the design is unmistakably Pininfarina, with an elegant shape, handcrafted in Italy from aluminium and wood. And its ethergraph tip allows it to write forever, without ink [yes, it is magic, Ed]. 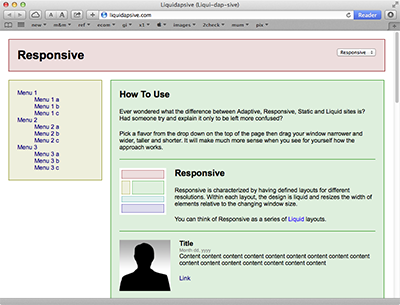 Ever wondered what the difference between Adaptive, Responsive, Static and Liquid sites is? Had someone try and explain it only to be left more confused? Pick a flavour from the drop down on the top of the page then drag your window narrower and wider, taller and shorter. It will make much more sense when you see for yourself how the approach works. 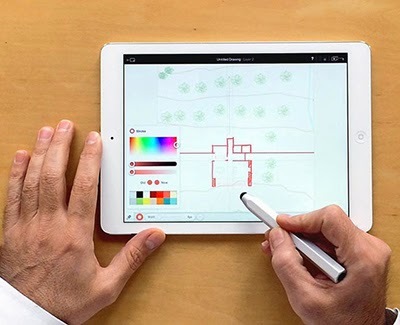 Archipad is a new iPad sketching app by Urban Design that is scale aware. Once you set the scale of your drawing sheet, the drawings will be completely scaled to the real world, even down to the line thickness. In addition, Archipad has many other features that cater to architects and designers, including layer rotations, shape and freehand drawing tools and more. It has a tiered pricing structure, it’s free to download for small projects. As projects become more complex, the user can buy a subscription for however long or short they need the app for.